We are plagued with information imbalances. Have you ever tried explaining a grammar concept to a non-writing friend and it just doesn’t stick? When we know something, we don’t remember what it’s like to not know it. At least, not easily. We have to overcome what’s known as the Curse of Knowledge. You’re likely familiar with the cliché, “those who can, do; those who can’t, teach.” Sometimes, we think this saying is a dig at teachers, but more truth lies in what is says about somebody who knows the ins and outs of their area of expertise. They’re buried in a wealth of knowledge and can’t see above it to give the novice a high-level introduction. The CEO of a company has decades of business wealth filed away into his brain and comes up with this incredible corporate goal that sums it all up: “Achieve efficient manufacturing!” When his employees are at a loss as to how to interpret this into achievable steps, he’s at a loss for how to explain it to them. You might be better at teaching a concept to somebody else by sharing your discoveries with them as you learn. What does this have to do with your writing? You have a wealth of knowledge in your head about your story. If you’re writing a fiction, you can picture your characters’ world simply by closing your eyes. You know your characters perhaps better than you know your own family! If you’re writing a memoir, it’s all about you and, of course, you’re the expert. You know and lived your history. You need to watch out for the Curse of Knowledge in your writing. Will your reader be able to follow your story? Revisit your writing later: When you’re in the midst of your words from chapter twenty-two, it all makes sense to you. But when did you last review the first chapters? When you go back to your writing after a long enough break, you can see it with a fresh perspective and notice areas of confusion. Tell don’t show: You’ve likely heard this phrase over and over and over throughout your education and career. It matters. And this is an example of where it matters. The CEO example above is the boss telling his people what to do instead of showing them. A quick way to find places where you’re telling is to search out all of your adverbs. When you find them, ask yourself if you need to rework that section to better show your story. Tell a story: Uh, that’s what you’re doing, right? You’re writing a story so duh. You’re telling it. But, are you using stories within your stories? My example comes from my memoir I’m writing right now. The focus of my story is one summer spent during college selling books door-to-door, but many of my experiences need my back story. My story includes my stories: the high school boyfriend; the freshman roommates; the calculator from high school math; the accounting class that stole my scholarship away from me. These didn’t happen that summer, but by weaving them in, they give a better understanding of the me from that summer. Take your story to your writers’ group: Others don’t suffer from your Curse of Knowledge so ask them to read and respond. Get feedback. I use my writers’ group for this, as well as some friends and family. The writers’ group is the best bet for me, because they are there for that purpose and don’t feel imposed upon. And they’re lovely. Do you have any tips to add to my list? 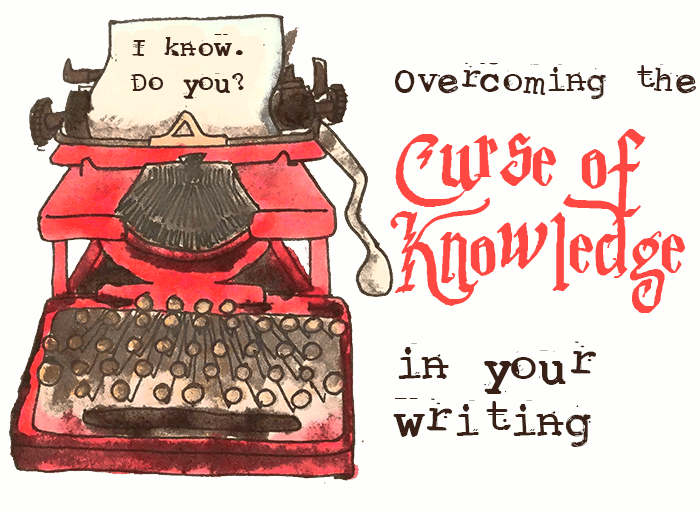 How do you overcome the Curse of Knowledge in your writing?